The flesh of walleye is firm, white, fairly dry and virtually free of bones. There is no commercial walleye fishery in Wisconsin waters of Lake Michigan and Lake Superior. Michigan tribal fishermen harvest some walleye using gill nets in Lake Huron and Lake Michigan, but the majority of walleye caught commercially in the Great Lakes come from the Canadian waters of Lake Erie. Because walleye is such a popular fish on restaurant menus, scientists and fish culturists in Wisconsin have been working to find a way to raise them on fish farms. Research supported by the UW Sea Grant Institute and the UW-Stevens Point Northern Aquaculture Demonstration Facility (UWSP-NADF) found that a naturally-found hybrid walleye (a cross between female walleye and male sauger that is often called a “saugeye”) grow extremely fast, making it possible to raise them to harvest size in one year in recirculating aquaculture systems. 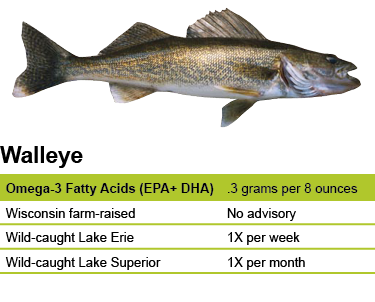 Results from this research and ongoing studies at UWSP-NADF may soon bring Wisconsin farm-raised saugeye to your local grocery store. State health agencies have found that it is safe to eat Lake Erie walleye once a week. The walleye is one of the most highly prized game fishes in Wisconsin. Thousands are caught each year during their spring spawning runs. In clear waters, walleyes usually stay in deeper areas during the day, moving into the shallows at night. In more turbid waters, they can be caught throughout the day. The large, unusual eyes of the walleye are designed to help them easily find their prey. Climate change appears to be making Lake Superior more habitable for walleye. Wisconsin Sea Grant-funded research has found that Lake Superior is warming faster than any other lake on earth. Walleye have been historically limited to warmer waters near the shore of Lake Superior and in shallow bays. But since the lake has warmed six degrees Fahrenheit in the last three decades, walleye habitat has increased dramatically.